The best recipes are often the most simple. This is a favourite in our household and always a hit anytime we have served it to others. These are SO quick and SO easy. Prepare the falafel mixture as per the instructions on the box and set aside as it needs time to absorb the water. This is usually about 10 minutes. In the meantime peel and grate the beetroot. You need ½ cup. Set aside any leftover beetroot for another day. Finely chop the coriander and parsley. Add the beetroot, coriander, parsley, garlic, salt and pepper to the falafel mixture and stir all the ingredients until they are well combined. Make teaspoon size balls out of the mixture and place them on a plate. 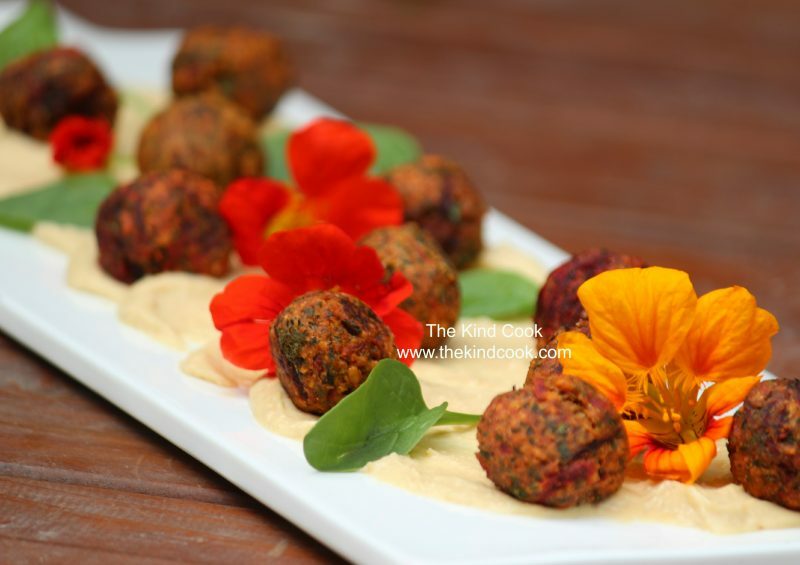 Carefully shallow fry the falafel balls for a minute or 2, in rice bran oil until golden brown then place them on paper towelling to drain. I serve my beetroot falafels with hummus, grated (unpeeled carrot), sliced capsicum, diced fresh tomato, steamed corn on the cob, soft tortillas, fresh spinach and spicy guacamole. It’s a delicious meal! Time: 15 minutes. 25- 30 minutes if you are serving them as I have suggested above. Notes: Make sure there is a lot more falafel mix than there is beetroot or its impossible to ball and will fall apart when you try to fry it. To test if your oil is hot enough, just throw a little bit of bread into it and if it sizzles the oil is hot enough.